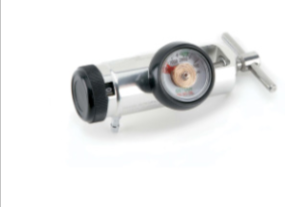 When you need to provide oxygen therapy, the O-Two Adjustable Oxygen Therapy Regulator provides quality manufacturing and performance. The "Aluminum Free" brass construction improves product safety by reducing the risk of exacerbating regulator fires should they occur. Where weight is a concern the aluminum body/brass core regulators provide the security of all brass construction. With its offset gauge and small diameter body, these regulators are one of the smallest of their type. Ideal for all applications where adjustable oxygen therapy 0 – 25 lpm flow rates are to be provided. It is unbeatable for quality, size and performance. Size: L6.0" x H 1.75" x W 1.25” approx. Today's high performance ventilators and resuscitators need high performance regulators to optimize their output capability. That's why the combination of diaphragm regulator technology and Unibody design makes the O-Two Oxygen Regulator the perfect choice to meet the needs of the respiratory impaired patient. By providing consistent output pressure and flow over the entire cylinder contents, the SQD Oxygen Regulator with its 2 DISS Self-Sealing Outlets ensures the maximum operating time on any cylinder. The "Aluminum Free", all brass construction improves product safety by reducing the risk of exacerbating regulator fires should they occur. 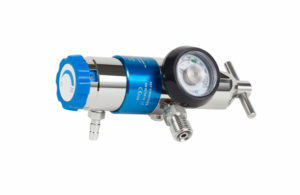 The regulator range provides optional 0 - 25 LPM therapy flow and two 50 PSI DISS connectors. 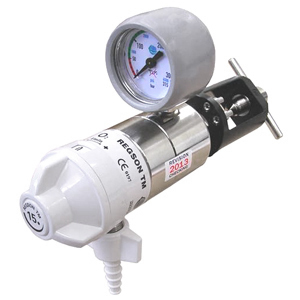 The Regson regulators are a compact but robust range of medical oxygen regulators with a built in therapy flow selector. The inlet fitting is a swivelling type pin indexed yoke which allows the outlet to be orientated into the required position (ideal for portable therapy systems). Models with one or two self sealing S.I.S. connections are available. The inlet fitting is a swivelling type pin indexed yoke which allows the outlet to be orientated into the required position (ideal for portable therapy or resuscitation systems). We can put your flowmeters and regulators into a service schedule with your other equipment. Contact us here for more information.